• Improve their approach to their strategic accounts. • Urgently accelerate revenue and profitability growth from their strategic accounts. • Improve the stability of their relationships with their strategic accounts. •Embed a standard system for Strategic Account Management (SAM) to institutionalize their knowledge of their clients. What Issues do our Clients Face? There are obviously many issues that all companies face, but we believe there are a few that we address directly. • A need for revenue and growth acceleration. • A demand for more profit generation per strategic account. • A desire to institutionalize an account management process that helps you deal with the issues and relationships you face with your customers every day. • A demand from your clients to build trust based relationships, as opposed to being a vendor. • A need for more business and industry knowledge. • A creation of an internal culture that has a great “Sense of Urgency” in creating new business opportunities, and reacting to current business events. How Do You, Our Clients, Benefit? You can expect the following results. • An increase of revenue of two to three times your normal growth within your trained account facing teams. • More cross-selling and up-selling opportunities by developing integrated relationships with your customers. • Learning how to build stronger Client Relationships, and turn a service or product offering business into a trust-based business. • Opening up Opportunities that you didn’t see before, or even knew existed. • Transforming your business from a project-based business to an annuity-based business, with fewer competitors and greater profit margins. • Ability to identify the Key Issues that will help you strengthen your relationships with each client, and also help you drive revenues with these clients. • Have a tried and tested process institutionalized within your strategic account teams. There are three fundamental elements in our process: Relationships, team dynamics and strategy. 1. CREATING DEEP AND LASTING CUSTOMER RELATIONSHIPS. 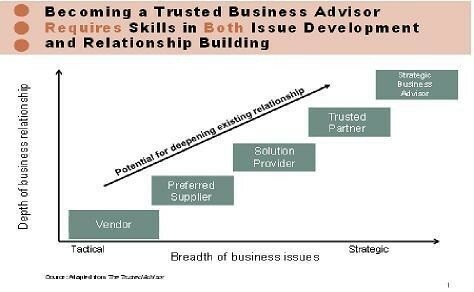 “Becoming the Trusted Business Advisor”. Moving upward in the relationship ladder. We place heavy emphasis on experienced coaching, in our work with clients, to create high performance customer focused teams. The coaching only works if it is provided by “industry hardened” coaches, with years of practical experience. 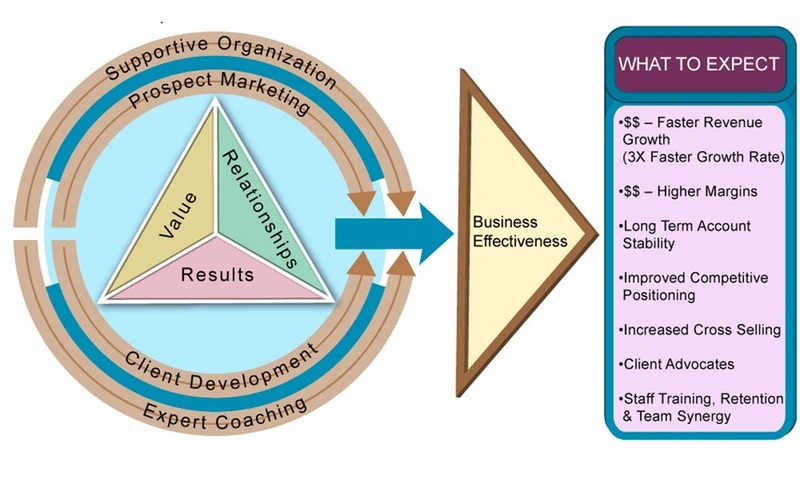 The importance of coaching is shown in the following diagram. 3. HIGH PERFORMANCE ACCOUNT TEAM DEVELOPMENT STRATEGY. Our team development work is built upon our proprietary processes for the effective identification and discussion of issues, “Issue Articulation and Decomposition”™ blended with a method to help our clients’ account teams continually strive to understand their clients through better trust defined relationships. 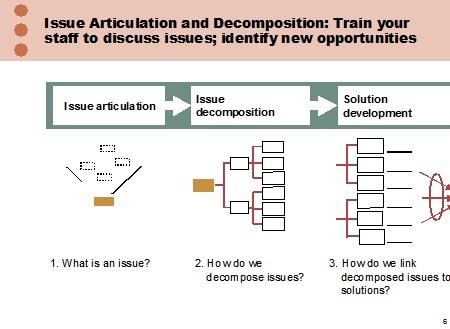 The figure below illustrates “Issue Decomposition”, a vital part of appreciating issues from their clients “Point of View”. If you are interested in learning more about our SAM system, please email me and I will send you a link, with a password, to a Powerpoint presentation that explains our SAM system in greater detail. There is some proprietary information in the presentation, and so we only want companies that we can truly help viewing the presentation. You can also contact me, through my email below, and we can discuss how our Strategic Account Management (SAM) system can help grow your business faster and more profitably.